NIA CHARLESTOWN NEVIS (March 16, 2017) — The Nevis Disaster Management Department (NDMD) in the Nevis Island Administration (NIA) and the Embassy of Japan to St. Kitts and Nevis, signed a US $370,529 grant contract for the implementation of a project to improve disaster resilience and emergency shelter management on Nevis. The ceremony was held at the Emergency Operations Centre, Long Point on March 15, 2017. 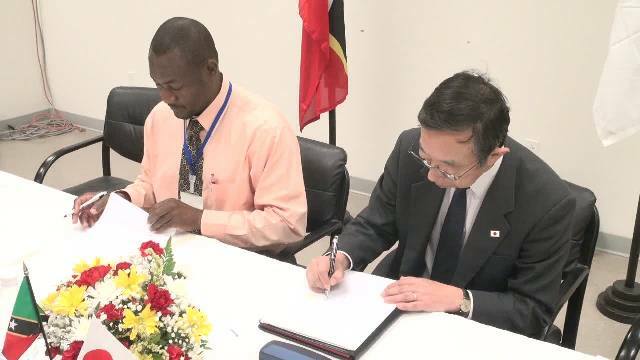 Mr. Masatoshi Sato, Minister-Counsellor and Deputy Head of Mission at the Embassy of Japan to St. Kitts and Nevis signed the grant contract documents and a Memorandum of Understanding (MOU) on behalf of the Government of Japan and Director of the NDMD Mr. Brian Dyer signed on behalf of the NIA. In an overview of the project, Dyer explained that the MOU commits both parties to work more closely with each other towards the common goal of building resilience on Nevis. The project entails the refurbishment of the Albertha Payne Community Centre at Bath Village; the construction of rock reinforcement along the waterway in Stoney Grove to mitigate flooding and flood damage; construction of a retaining wall at Fenton Hill to mitigate the occurrence of the rock fall hazard which would make it safer for motorists; the installation of aluminium shutters on 10 community centres; repairs to the roofing of the Butlers Community Centres; Installation of electrical water pumps at the Jessups and Prospect Community Centres; the erection of official plates at all project sites and the financial audit of project activities. Mr. Dyer said the signing ceremony marks the completion of a sustained effort of collaboration among staff of the Embassy, the Premier’s Ministry and the NDMD. He assured that the NDMD would do all it can for successful implementation of the project. 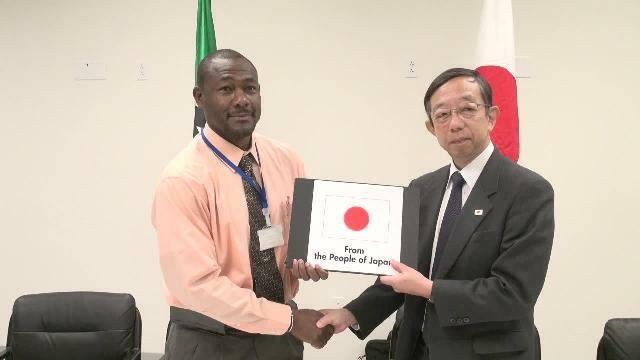 He said their dedication and commitment would enable them to develop a stronger relationship and friendship between the peoples of Japan and Nevis. Meantime, Mr. Sato, in his address said the Government of Japan is pleased to support the invaluable work of the NDMD on disaster risk reduction, preparedness and management. He said the grant funding was made possible through the commitment of Japan’s Prime Minister His Excellency Mr. Shinzō Abe, during the first Japan CARICOM (Caribbean Community) Summit Meeting in July 2014. As a result of its CARICOM policies, the government of Japan intends to corporate with St. Kitts and Nevis and other CARICOM member states in areas of managing disasters, protecting the environment and coping with climate change. Mr. Sato added that the funding is expected to contribute significantly to Nevis strengthening its resilience against natural disasters. He said he was looking forward to continued collaboration and friendship between Japan and St. Kitts and Nevis. Also present at the ceremony was Permanent Secretary in the Premier’s Ministry Mr. Wakely Daniel, who delivered welcome remarks.